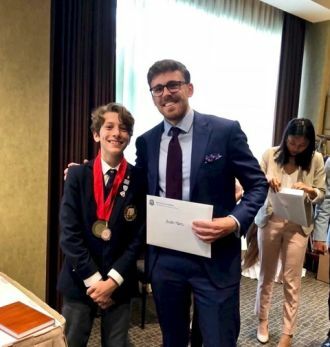 Grade 8 student, Andrei Maris, competed in the 2018 Canadian Junior High Speech Nationals in Vancouver, British Columbia. At Speech Nationals, Andrei tested his public speaking mettle against a field of Grade 8 and Grade 9 students from across Canada in persuasive speaking, interpretive reading, parliamentary debate, and impromptu speaking. Delivering his persuasive speech on the little known environmental impact of cruise ships, Andrei’s address, “charted a course from the history of oceanic cruising to the impact it has on coastal communities, and the toll it has on marine life.” Through two rounds of tough competition, Andrei earned a place in the Persuasive Speech Finals where he was pitted against 7 talented rhetoricians. In the Persuasive Speaking Finals, Andrei’s thoroughly researched rhetoric made an immediate impact. As he reached his urgent call to action, he asked the audience to demand, “greener and greener,” cruise ships and governments with popular cruise ports to “create legislation that forces cruise companies to meet basic environmental standards.” His final urge, to “create a future anchored in sustainability,” was met with resounding applause. In a first for Pickering College, Andrei Maris was awarded 1st Place in the Persuasive Speaking Category at Jr. Speech Nationals. Adding to the achievement, Andrei finished 10th in Canada across all four categories and out of a field of 41 public speakers. Congratulations to Andrei for this incredible performance!